The City of Santa Monica's third annual open streets event COAST will celebrate the city's commitment to art, sustainability, and mobility on Sunday, Oct. 7 from 10 a.m. to 4 p.m.
At this free event, the public will experience 2 miles of streets closed to car traffic and filled with interactive art exhibits, live performances, local food and business purveyors, and connections with families, friends, and neighbors. Aerial Artist John Q will gather up to 1,000 people in real time at the event creating a live human installation to artistically illustrate art, mobility and sustainability. Artists Jana Cruder and Matthew LaPenta demonstrate the impact of disposable plastic on the natural environment with their larger-than-life art installation titled, Natural Plasticity, constructed of a massive plastic straw and giant plastic bottle towering nearly 30 feet high. Event goers will have an opportunity to contribute their personal mark to artist Peter Tigler's interactive thumbprint mural that will take shape with public participation to illustrate a message of mobility and sustainability. 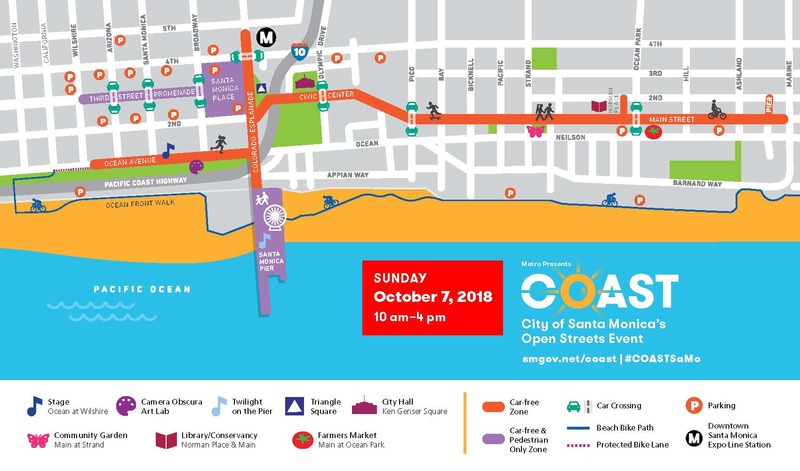 COAST will be held on 2 miles of streets closed to street traffic, including Ocean Avenue from Wilshire Boulevard to Tongva Park, as well as Main Street to Marine Street. To attend COAST, visitors can ride the Expo Line, Big Blue Bus, or take advantage of Santa Monica's 110 miles of bikeways. This article was repurposed from a City of Santa Monica press release.